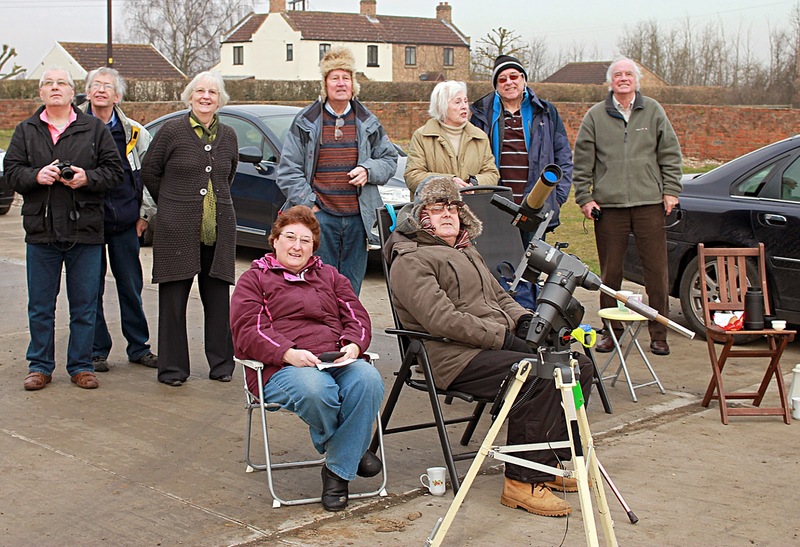 10 of us gathered at Partridge Farm on High Common Lane, Austerfield, and set up the equipment, Elaine's 6" Celestron, and the PST solar telescope, in clear sunshine, a fine morning. All ready for the start of the event. We were, Peter and his daughter Gill, Paul and Elaine, Robin and Sheila, Sandra and John Cox, not seen him in many a year, Rhys and Vic. 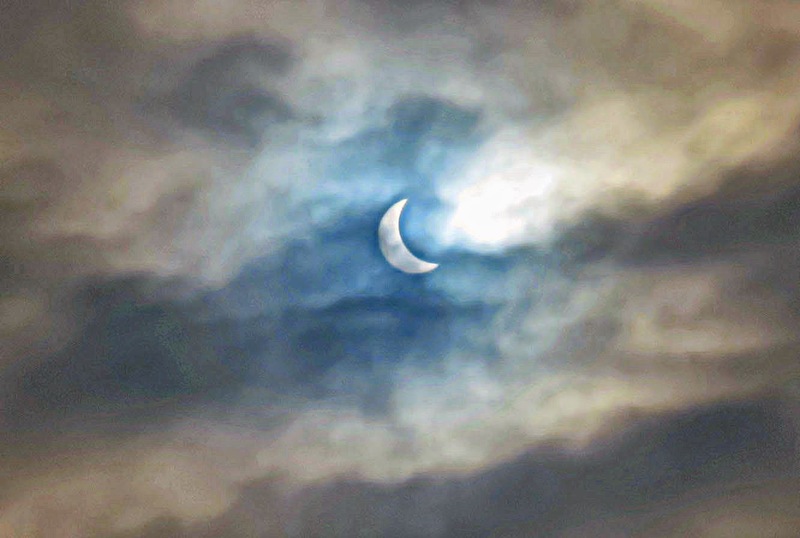 But, of course, not unexpectedly, the Cloud God put his oar in, and covered the sky with mottled clouds from the start of the eclipse to the end, to the minute! 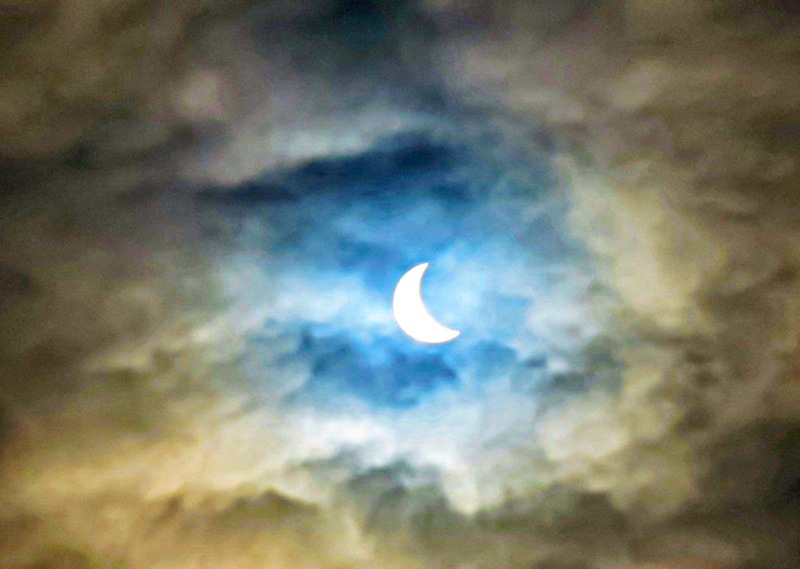 So we were stuck with trying to use our solar viewing spectacles, retained from the last eclipse, No. 11 welding glasses etc. 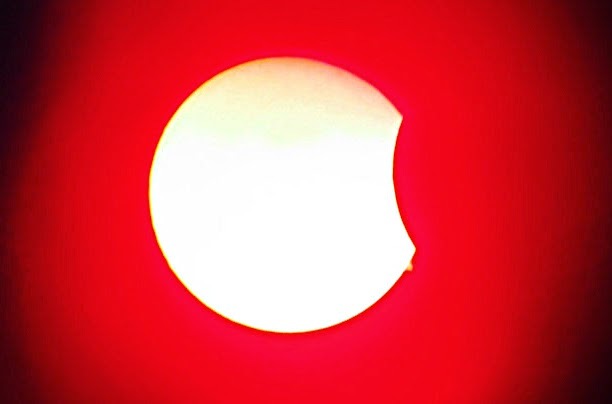 but in the event it proved best to use ordinary sunglasses aided by the cloud cover, changing quickly to welding glass when a clear patch moved across the Sun. Robin and Sheila had some success with a pinhole arrangement in a card, and John successfully projected the image onto a card using binoculars. 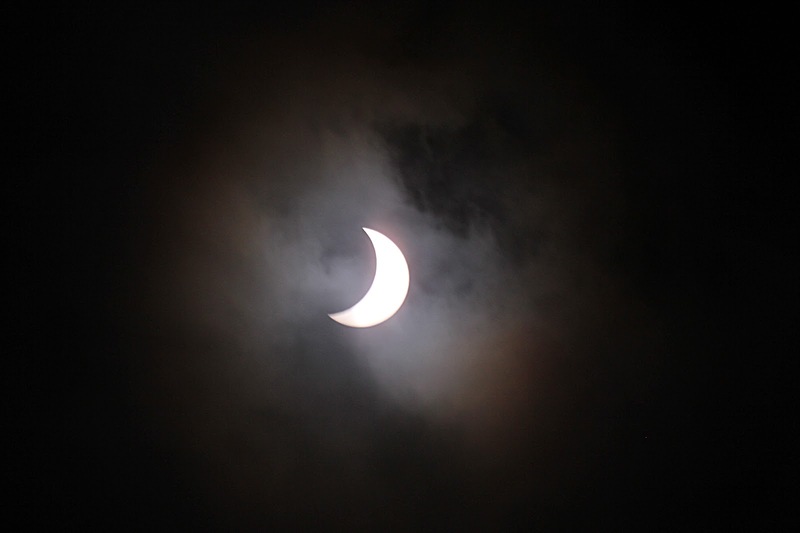 We also had to revert to our domestic point-and-shoot cameras, but still were able to obtain the results you see below. 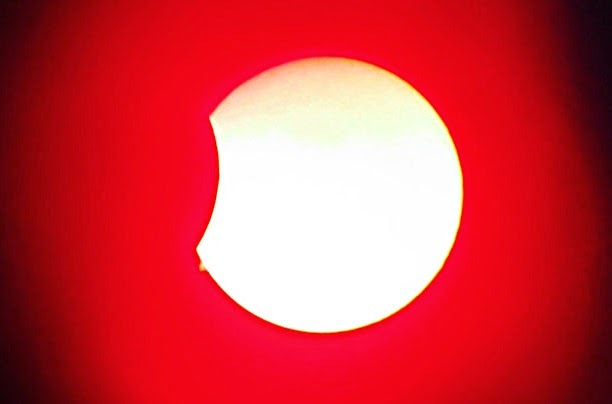 The Sun was in good condition too with several prominences round the limb, and some filaments on the face with plenty of granulations too, but only after the clouds and Moon had left the scene. Taken by Robin Hodges using a Canon Power Shot. 26mm FL lens at f/5.6. This and the next photo were taken with a lens of his sunglasses over the camera lens. You do what you have to to get a result! This is the group that gathered at Partridge farm that morning, gazing hopefully at the Sun, willing the clouds to go, but to no avail. Photo taken by Paul Booker of Wong.